A little over a year after giving the world its first glimpse at the iPhone X, Apple has gone all-in with the new all-screen design philosophy. 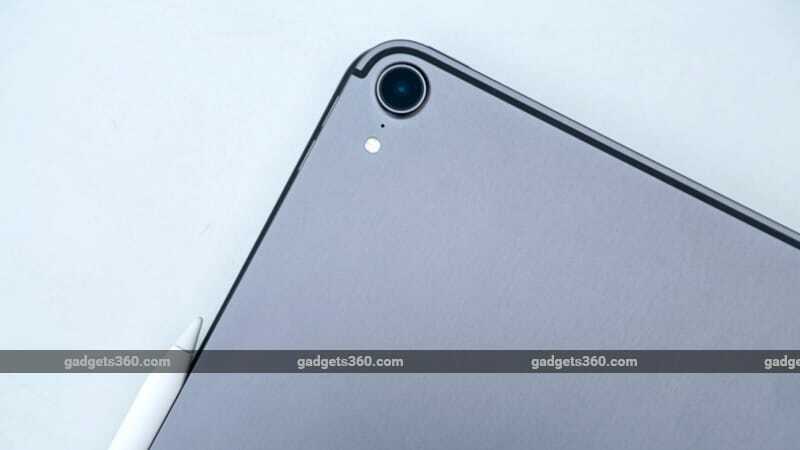 The company recently launched as many as three new iPhone models along the same lines and, as expected, revamped iPad Pro models were unveiled at a media event in Brooklyn late last month. The iPad Pro has gone down the same route by maximising screen space and getting rid of the home button. Apple has been pushing the iPad — and the iPad Pro specifically — as a computer that can replace a laptop for many users, or be the first computer for those who've never used a laptop before. At the New York launch event, CEO Tim Cook said on stage that the “iPad is the most popular computer in the world”, as Apple claimed to have sold more iPad units last year than HP, the biggest laptop vendor, sold portable computers. John Ternus, Vice President, Hardware Engineering at Apple later stressed that thanks to Apple's new A12X Bionic chip, the new iPad Pro models are “faster than 92 percent of all the portable PCs sold in the last 12 months, including the most popular core i7 models from the top manufacturers”. That's a tall claim from Apple, but the company has been at the top of its game when it comes to CPUs, so we wouldn't be surprised if the new iPad Pro models actually deliver in terms of performance. But how does the overall package hold up? More importantly, will their increased price tags hurt them, especially in India? We put the new 12.9-inch iPad Pro model through its paces to find out. As we mentioned before, the big story with the new iPad Pro models is the removal of the home button. This means the bezels are a lot thinner, though the new iPad Pro models don't quite live up to Apple's “edge-to-edge” claim. The bezels are slimmer than before but still noticeable, which is not such a bad thing because they still leave enough room for you to hold the iPad without having to worry about accidental touch input. What's more, the bezels mean that Apple was able to integrate the front camera and Face ID sensors without having to resort to an iPhone X-like notch. Unlike the iPhone, Face ID on the iPad works no matter which way you're holding the tablet, which is a necessity given people can — and do — use tablets in different orientations. This means it will work no matter which way you pick up the iPad, and even when you are using it while connected to an external keyboard. What's even more impressive is that it's been implemented using a single set of (improved) sensors, just like on the iPhone, without the need for sensors at different places on the tablet. There are a couple of things to keep in mind though. Just like the new iPhone models, you can tap the iPad Pro to wake the screen, though raise-to-wake is not supported, which was a bit of a surprise. We hope a future software update brings an option to change this behaviour. Given all the different ways that people pick up an iPad, if it so happens that your hand ends up covering the Face ID sensor, the iPad shows a “Camera covered” message on the screen with an arrow indicating the position of the camera, since it might not be clear to everyone which “camera” is being talked about. This is especially true when you are using the iPad Pro without the keyboard, since the symmetrical and button-less front makes it impossible to tell one edge of the iPad from another. 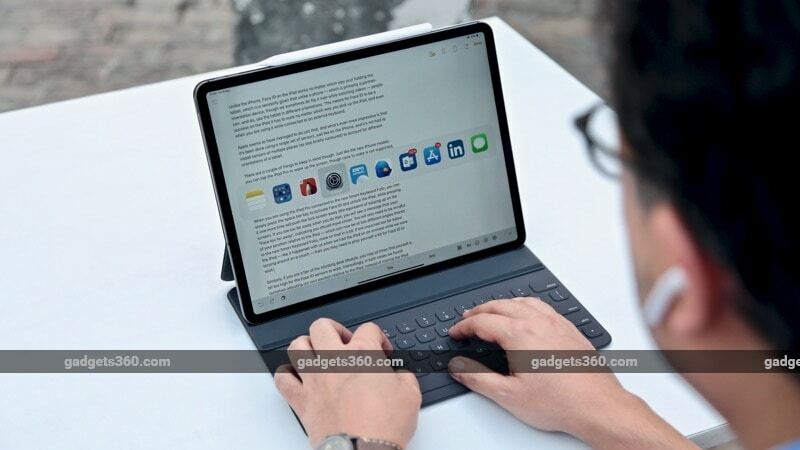 When you are using an iPad Pro connected to the new Smart Keyboard Folio, you can simply press the spacebar to activate Face ID and unlock the iPad. Pressing it one more time will push the lock screen away (the equivalent of swiping up on the screen). If you are out of the camera's range when you do that, you will see a message that says “Face too far away”, indicating you should move closer. You will also need to be mindful of your position relative to the iPad. If you are crouched too far below the iPad — like it happened with us when we were lazing on a couch with the tablet on an armrest — then you may need to prop yourself up a bit for Face ID to work. Similarly, if you are a fan of the standing desk lifestyle, you might at times find yourself a bit too high for the Face ID sensors to work. Interestingly, in both cases we found ourselves adjusting our own posture relative to the iPad Pro, instead of moving the device itself. This is probably not a surprise given that the iPad was propped-up thanks to Smart Keyboard Folio and the experience will obviously be different if you have it in your hand. To summarise, while Face ID worked as expected in most cases, even a few days into using this iPad, it hasn't disappeared into the background like it does with the iPhone. At this point into our time with the iPhone X last year, we had just forgotten about Face ID and come to appreciate its seamless performance. That's certainly not the case with the iPad Pro and — so far at least — we're certainly mindful of its presence. With the home button gone, the gesture-based UI is the only way to find your way around the iPad Pro. You have to swipe up from the bottom to go to the home screen; swipe up and hold to bring up the multitasking screen; swipe down from the upper-right corner to bring down the Control Centre; and swipe down from the upper-left corner to bring down the Notification Centre. You can quickly swipe left and right to switch between apps, similar to how you do on the iPhone X-series. iOS 12, of course, has brought these gestures to other iPad models as well and they are not limited to the new iPad Pro alone. Just like on the iPhone, the gestures feel natural and we got used to them pretty quickly. Flipping between apps is especially fun and easy to do the iPad's bigger screen. When the iPad Pro first came out, one of the headline features was its support for Apple Pencil. However, it's safe to say that usage of the Pencil never really took off in the way Apple would've hoped. At least part of this has been down to some of the decisions the Cupertino-based company made while designing its stylus. 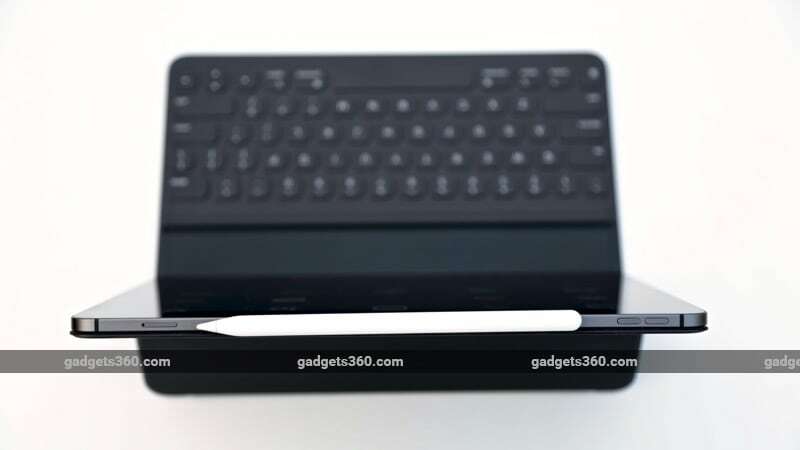 There was no way to store the original Apple Pencil with the iPad, even if you bought the Smart Keyboard, which often meant that you wouldn't have it with you when the need arose. Apple tried to address that by releasing some accessories with the second generation iPad Pro models designed to keep the Pencil with the rest of your stuff, but they had their own share of problems that are not worth repeating at this point. 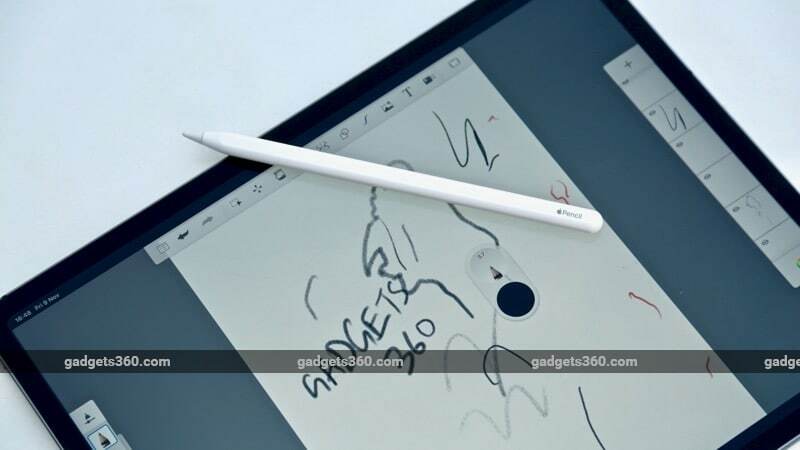 The second-generation Apple Pencil seems to have been designed keeping in mind that it is first and foremost a companion to your iPad. It sticks magnetically to the iPad, which means you are more likely to have it with you all the time. The Pencil also no longer needs to be plugged into the iPad for pairing/ charging. You simply place it on the iPad and it's automatically paired. What's more, you will see a small message popping up on the screen showing the Pencil's battery level and to indicate that it's now being charged. The Apple Pencil features a flat edge, which allows it to rest on the iPad. You can now double-tap on the lower third of the Pencil to trigger actions, a feature we'll address in a bit more detail later in this review. You still need to have Bluetooth turned on for the iPad to communicate with the Pencil. The new Pencil cannot be used with older iPad models and the old Pencil won't work with the new tablets either. 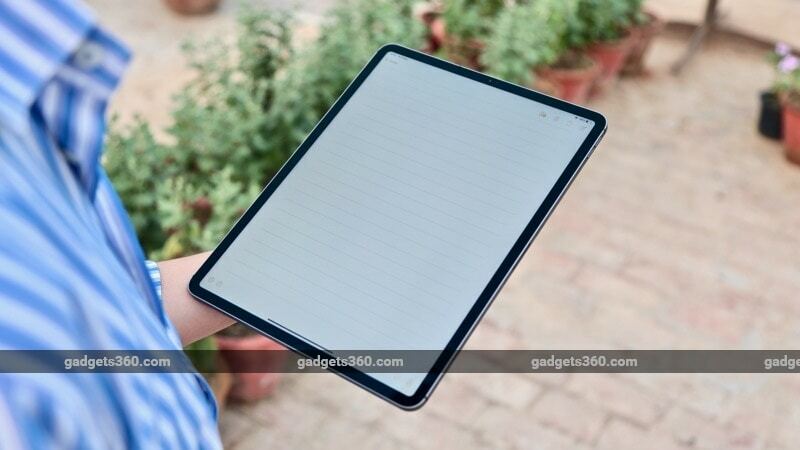 The iPad, of course, has also been redesigned and it too has flat sides. Note that the Pencil will stick to only one of the sides of the iPad Pro — the top one when you have the iPad Pro in landscape mode with the Smart Keyboard Folio attached. This side has a little area in the middle that's used to wirelessly charge the Pencil. You don't need to worry about trying to align the Pencil with the area, as magnets will ensure it automatically snaps into the right place. The hold of the magnets is strong enough that the Pencil doesn't fall out of place during day-to-day use, including when you carry the iPad around in a bag. In many ways, the new iPad Pro design is a throwback to the original iPad design, but with a flat back (other than the camera bump) as well as rounded corners, the look really reminded us of the iPhone 5s. The Smart Connector has been moved from the side on previous iPad Pro models to the back, near the bottom. You won't really notice this if you are using the iPad with the Smart Keyboard Folio attached. The Smart Keyboard Folio now covers both the front and back of the iPad, a change from the previous Smart Keyboard, which only covered the screen when closed. This eliminates the need to buy a separate back cover for the iPad, which we believe is a welcome move, but not everyone may welcome the additional bulk. 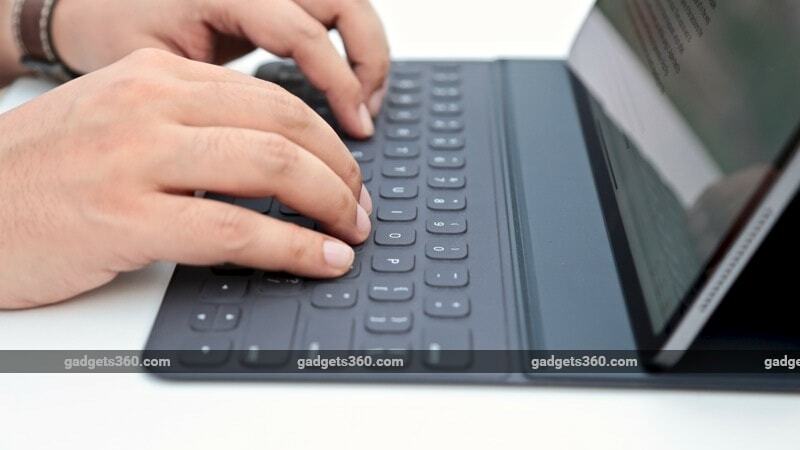 The iPad Pro has 102 magnets on the inside, most of which are used to ensure that the Keyboard Case sticks to the iPad when needed. It's still relatively easy to snap the iPad out of the case when you want; in fact, we did that accidentally on more than one occasion when opening the case to work on the iPad, by pulling on the back cover instead of the front, but it's just as easy to snap it back on. You now get two viewing angles — with one of them optimised for working on a desk, and the other one for when you have the iPad Pro on your lap, according to Apple. 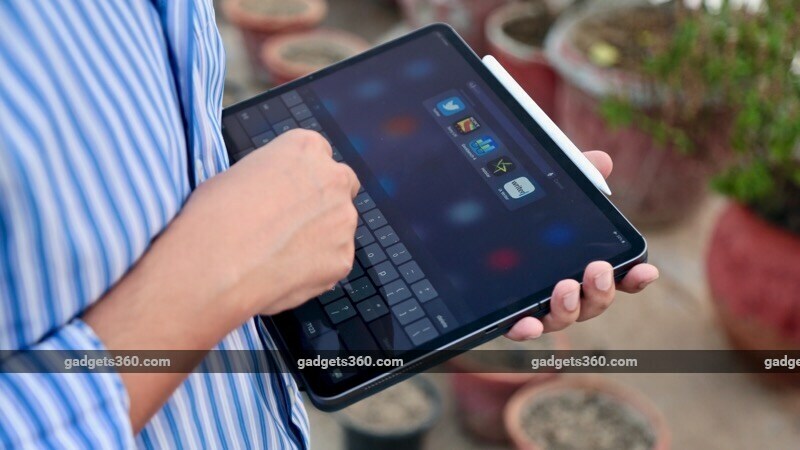 The keyboard itself and the experience using it haven't changed much since we last reviewed an iPad Pro. We wish the keyboard had a bit more travel to it and the keys were backlit, but we realise that may not be possible without adding significant depth and/ or weight, and increasing battery consumption. Like before, the Smart Keyboard Folio draws all the power it needs from the Smart Connector and doesn't need to be charged. Without the keyboard cover, the 12.9-inch iPad Pro Wi-Fi + Cellular model is nearly 60g lighter than its predecessor, and at 5.9mm, it's 15 percent thinner as well. It's also nearly a full inch shorter than the previous-generation model, which makes it a little bit more manageable. This is a welcome move, as the previous 12.9-inch iPad Pro was rather ungainly for use as a tablet i.e. when not propped up with the keyboard. With the smaller 11-inch iPad Pro, Apple has gone the other way by increasing the size of the screen while largely retaining the outer dimensions of the previous 10.5-inch model. While we don't have that one in for review today, we believe a lot of people will really appreciate the extra portability of that form factor, now with a slightly bigger screen. Arguably the most interesting change in the new iPad Pro models is the decision to ditch the Lightning port in favour of a USB Type-C port. This enables some additional uses cases like connecting cameras directly to the iPad instead of requiring a Lightning to USB Camera Adapter. Still, most people won't have Type-C cables for their camera and will need a Type-C to Type-A dongle, so the gains here are questionable. The iPad Pro does support USB 3.1 Gen. 2 capable of hitting speeds up to 10 Gbps, so you should benefit from faster data transfers. The Type-C port also enables you to drive higher-resolution external displays while also using the port for other purposes via the magic of dongles, which we will get to later. 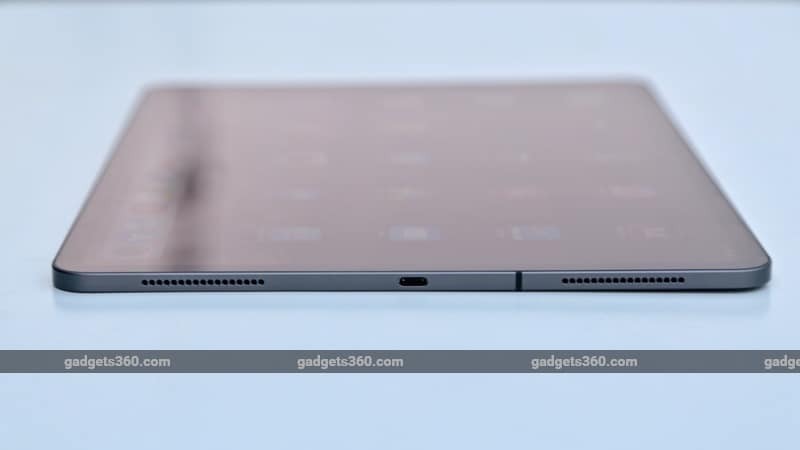 Controversially, the iPad Pro does not have a headphone jack. In our opinion, this feels like a bigger miss on the iPad than on the iPhone, since the device is geared for Pro use. Latency can be an issue with wireless audio if you don't have the right set of headphones, not to mention your work could come to a halt if their battery runs out. Apple says that with smaller bezels there was no space in the iPad Pro to accommodate a headphone jack, but one wonders if it would've been worth having slightly larger bezels on one side to accommodate the legacy port. What's more, Apple does not bundle a Type-C to 3.5mm adapter or even a Type-C to Type-A dongle in the iPad box. All you get is the iPad, an 18W charger, a Type-C to Type-C cable, and the usual literature. As before, the 12.9-inch iPad Pro has a 264ppi 2732x2048 resolution display, though it gets the new "Liquid Retina" name we first saw on the recently launched iPhone XR. This fully laminated display with its anti-reflective coating is up there with the best LCD panels we've ever seen, and like earlier iPad Pro models, it supports True Tone colour adjustment, ProMotion with a refresh rate of up to 120Hz, and a wide colour gamut (DCI-P3). Apple says the iPad Pro also has a "fingerprint-resistant oleophobic coating", but like the 10.5-inch iPad Pro we reviewed last year, we found the new tablet to be a fingerprint magnet. To be fair, fingerprints are visible only when the screen is off, and aren't really a hindrance when you are working. Though the display on the new 12.9-inch iPad Pro has the same resolution as its predecessor, thanks to the new rounded corners and the Home Indicator, some app developers might need to update their apps to ensure every single pixel is utilised. We noticed small black bands around the edges when using apps that haven't been updated yet. 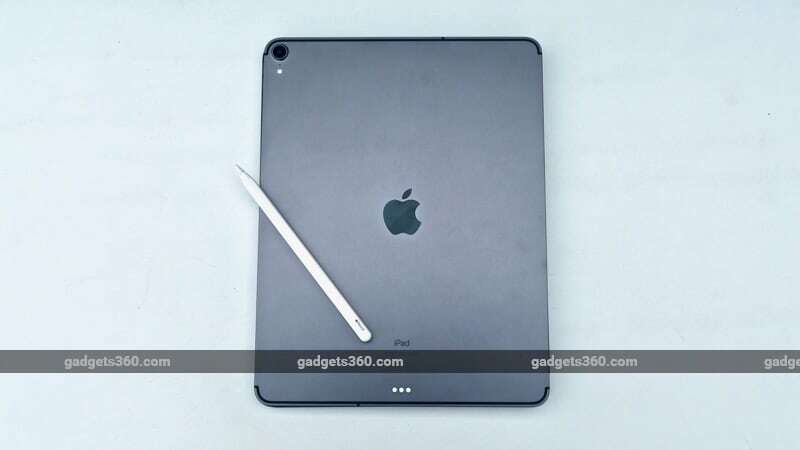 The new iPad Pro is powered by Apple's brand new A12X Bionic chip, an enhanced version of the 7nm, 64-bit A12 SoC inside the latest iPhone models. Just like the A12, the A12X has an octa-core CPU consisting of four high-performance and four high-efficiency cores. 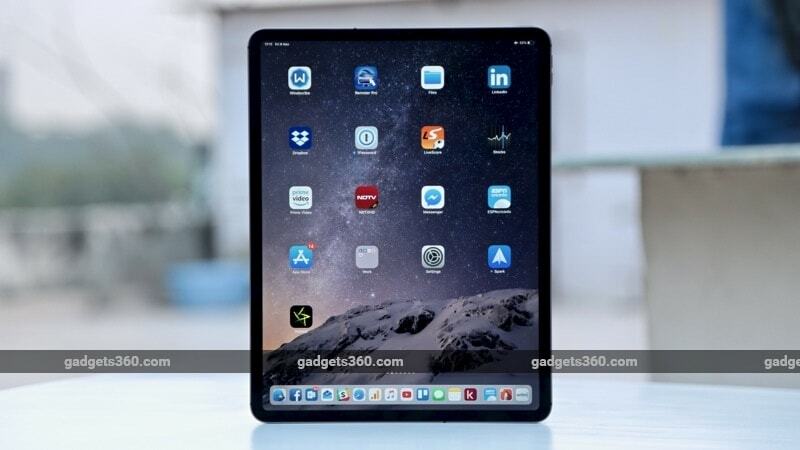 This is backed by the M12 coprocessor and a seven-core GPU that claims to offer twice the performance of the A10X Fusion in the previous iPad Pro. The A12X marks the iPad debut of an on-device Neural Engine, which is capable of up to 5 trillion operations per second. Apple says this enables enhanced performance in areas like AR, when stitching together photos or videos, and even while doing simple fun stuff like creating Memoji, which also make an appearance on an iPad for the first time. All this power combines to offer an experience that's up there with — and often exceeds — what you'd get while using a laptop. General Web browsing, checking email, writing documents, and even gaming are all smooth, but all that's hardly a surprise with a brand new Apple device. Gamers and those who enjoy reading graphic novels or comic books will especially appreciate the extra screen real estate the larger iPad Pro offers. Sure, iOS has its limitations — there's no support for external storage, for example — and a frustrating number of third-party apps have still not been updated to let you use them side-by-side (or to use picture-on-picture video playback) on the iPad to maximise your productivity, but it's entirely possible for many people to do most — if not all — of their work on an iPad Pro. With that said, there are plenty of edge cases — there's no way to "download" one or more files, for example, unless the link is from a cloud service such as Dropbox or Google Drive. Many tasks that would be simple on a Windows or macOS machine will need third-party apps or complex Shortcuts to accomplish on iOS. What this means is that most users who've grown up using a Mac or PC will almost always find it simpler to work on a "real" computer. On the flip side, users who don't necessarily have the same history with computers, will likely find that the iPad Pro works just fine for most things they would want from a machine. We've seen this validated by real-life use cases all around us, and we've been able to survive using an iPad as our only machine when hopping between meetings around town for the last couple of years, thanks largely to its built-in LTE connectivity and truly all-day battery life. Some poorly optimised in-house tools and Safari's inability to remember HTTP authentication passwords aside, we've had no issues getting our work done, though, admittedly, when both the iPad and the Mac are with us, we find ourselves reaching for the latter to get the job done faster. Talking about speed, the new iPad Pro is a complete beast in terms of benchmarks. In the single-core Geekbench performance test, the A12X is nearly as fast as the Intel Xeon W CPU in the iMac Pro we reviewed earlier this year. Granted, single-thread performance is not the iMac Pro's strongest suit, but that's still pretty impressive, especially when you consider that that's faster than all Macs — and of course iPads — we compared it against (see charts below) other than the latest Intel Core i9 MacBook Pro and a top-of-the-line 27-inch "regular" iMac. In Geekbench's multi-core test too, the new iPad Pro held its own, trailing only the aforementioned duo, and unsurprisingly, the iMac Pro. Given what we saw in benchmarks alone, Apple's claim of the iPad Pro being faster than most Core i3, Core i5, and even many Core i7-based PCs is completely on the money. Though Apple doesn't officially disclose the amount of RAM inside iOS devices, benchmarks showed that the 1TB 12.9-inch iPad Pro has 6GB of RAM. That's the most RAM shipped on any iOS device, and this means you are more likely to find your document or webpage ready for you when you switch back to an app, without waiting for it to reload. Granted, iOS manages the experience rather well, to the point that this isn't a problem unless you are using old hardware, but once you figure out what the extra RAM is enabling on your iPad Pro, you will come to appreciate it. The iPad Pro has eight audio drivers — four woofers and four tweeters — configured in woofer-tweeters pairs near the four corners of the screen. Apple says the bass goes to all four speakers while the mid and high frequencies come from the top-most speakers, no matter which way you are holding the iPad. The resulting sound is rich and clear, capable of reaching really high volumes without getting distorted. Though the speakers lack a Dolby certification or similar, it's safe to say this is the best sound we've experienced on a mobile or tablet. The iPad Pro now also supports Bluetooth 5 and, as we mentioned earlier, there's a USB Type-C port instead of a Lightning port. That doesn't mean you can connect any USB device to your iPad — you are still very much bound by the limitations of iOS. Connecting an external drive will give you an error — “Cannot read the connected storage media.” When Apple introduced the Files app on iOS, we'd hoped the next logical step would be letting you read any kind of external drive within the app, but we're obviously not there (yet). You can, of course, connect a camera directly to the iPad or use a dongle/ dock with a card reader to import photos directly on to the iPad. We tried various third-party dongles/ docks with our iPad Pro and had mixed results. Headphone jacks on dongles worked as expected, though we noticed that in such cases there's no way to force the iPad to output sound to the internal speakers, even if you don't have any headphones plugged into the dongle. 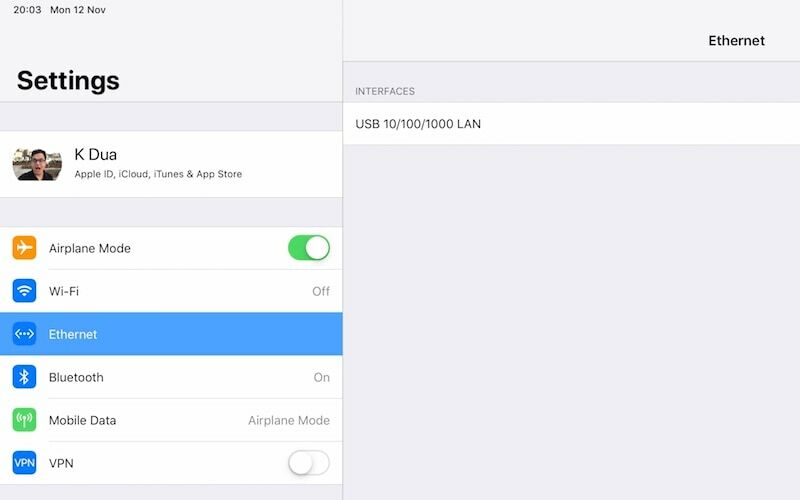 While iOS did not detect Ethernet ports on the multi-port dongles we tried, a standalone Monoprice USB to Ethernet adapter worked seamlessly, and an Ethernet section just popped up in Settings. As expected, our Thunderbolt 3 Apple USB Ethernet adapter didn't work — in fact if you plug in any Thunderbolt 3 accessory, you will see a “Thunderbolt accessories are not supported on this iPad” message on screen. Passthrough charging — the ability to charge the iPad with a charger plugged into a USB Type-C accessory — worked fine with dongles that support it. Various card slots built into our dongles, as well as external card readers plugged into USB ports, also worked just fine, with the Photos app firing up and offering to import the pictures on those cards. However, while trying various dongle and card reader combinations with the iPad Pro, we have lost images on not one but two memory cards — one is no longer being recognised at all (on any device) while the other's images folder is now strangely empty — and this is when we didn't do anything more than just view the images, not even import them. We don't know whether to blame the cards, the various dongles that we tested, or the iPad Pro, but it sure won't be fun telling the family that some of our precious memories might have been lost forever. Apple says that the iPad Pro can now now drive external displays of up to 5K resolution, and while we didn't have a 5K display around to test this claim, we did connect our iPad Pro to a full-HD display using the aforementioned dongles and an HDMI cable and everything worked as expected. When you are on the home screen, the iPad's display is mirrored on to the external screen. Since the aspect ratio of the iPad's screen may not exactly match the external display, you may see rather thick bars on either side of the on-screen contents. Apps will mimic this behaviour by default, but developers can choose to instead extend the display and use the external screen as a separate space on which to show additional controls or other UI elements. Apple apps like Keynote and GarageBand do this, and though some third-party apps like djay Pro do as well, most third-party apps that we used simply mirrored on screen. That might change if the use of external displays with the iPad Pro gains popularity. Another bug we noticed is that connecting an external display to the iPad would (occasionally) make the Wi-Fi icon disappear from the status bar on both the iPad and the mirrored display. The iPad Pro now supports reverse charging, which means you can use the tablet to charge other devices. We didn't have an official Apple Type-C to Lightning cable, so we used a third-party cable to charge an iPhone XS Max from the iPad to measure its effectiveness. In our test, the iPhone's battery went from 17 percent to 39 percent in 30 minutes, which is in line with what we see from chargers that do not support any kind of fast charging. In case you are wondering about the impact on the iPad Pro's battery, it dropped from 96 percent to 90 percent. While the Apple Pencil 2 is functionally identical to its predecessor, the design changes make it significantly better as a companion to your iPad Pro. For starters, the fact that it magnetically sticks to your iPad and charges wirelessly means it's more likely to be with you and be ready to go at all times. There's no Lightning connector on the Pencil so you don't have to worry about losing the tiny cap that covered it up, and more importantly, it means never having to come across the ungainly sight of a Pencil sticking out of an iPad's Lightning port because it ran out of juice. There are a few new tricks as well. As we mentioned before, you can now double-tap the lower third of the Pencil to trigger certain actions. In the Notes app, for example, you can switch between the Pencil and Eraser by double-tapping, and this behaviour can be customised via the Settings. Third-party apps can also integrate this functionality, with the ability to customise the actions triggered when you double-tap. What's more, there seems to be no restriction on the types of apps that can integrate this functionality, so, YouTube, for example, could implement a video play/ pause shortcut via the Pencil, giving you a limited remote control, similar to what Samsung introduced with the Galaxy Note 9. At the launch event, Apple demoed a third-party image editor that will make use of this functionality in an upcoming release, but we haven't come across any non-Apple apps that have implemented similar functionality just yet. In a move straight out of the Galaxy Note series playbook, you can now tap the Pencil on the lock screen to have the Notes app launch and ready to go. This behaviour is not enabled by default but you can go to Settings to change that. You can also tell the app whether to always create a new note or resume the one you were working on last. You cannot trigger the gesture-based UI actions with the Pencil, which leads to some awkward moments. At times, for example, we found ourselves doodling with the Pencil and wanting to quickly toggle something via the Notification Centre. Sliding down from the upper-right corner with the Pencil did nothing, so we had to use one of the fingers to trigger that action while continuing to hold the Pencil in our hand. This might be nothing more than a minor inconvenience for most people, but it might turn into an annoyance if you find yourself using the Pencil a lot. Like we mentioned before, iOS 12 brings the new gesture-based UI to the iPad as well as some minor additions to Safari, in addition to a couple of new apps like Stocks and Voice Memos. However, there are no major new iPad-focused features, and certainly nothing as radical as what we saw with iOS 11. We are extremely disappointed to still be restricted to a 4x5 icon layout even on a 12.9-inch screen, which just leaves too much empty space between the icons on the home screen. It's safe to say that iOS 12 has not pushed iPad software forward in any meaningful way, which is frustrating given how much better the hardware seems to get with every iteration. Talking about hardware improvements, the new iPad Pro boasts of better cameras on the front and rear thanks to Smart HDR, and some of the other improvements that we've seen on the iPhone recently. We also get Portrait Mode for the first time on the iPad, and it works reasonably well. Interestingly it's available only on the front. This isn't a problem, since we aren't fans of using a tablet as a camera to begin with. If you do need to use your iPad as a camera, you will get largely favourable results outdoors and when there's plenty of light, though the low-light performance is under par. All iPad models till date have delivered on their promise of all-day battery life, and this one is no different. With light use, you'll easily be able to go an entire week before you need to recharge your iPad. If you are investing in an iPad Pro, you probably want to use it for more than occasional reading, in which case it should last you a couple of days, with a few hours of use each day. Even if you use your iPad Pro as your only machine — starting a work day at 9am and ending it at 6pm — you should have a bit of juice left in the tank to, say, watch a few videos when you are headed back home. In our HD battery loop test, the iPad Pro lasted an impressive 14 hours and 7 minutes. Using the bundled 18W adapter and Type-C cable, we were able to charge the iPad Pro's battery from zero to 100 percent in 3 hours and 20 minutes. Using the MacBook Pro's 87W charger, we could top up the iPad Pro in roughly 2 hours and 40 minutes, which was a little underwhelming. So this year we've seen the introduction of the even more expensive iPhone XS Max, and other recently introduced hardware like the MacBook Air and Mac mini have continued this trend with entry-level configurations being priced higher than the machines they replaced. The iPad Pro models are no different, with the 11-inch and 12.9-inch models respectively $150 and $200 more expensive than their spiritual predecessors. In India, pricing for all Apple products is in the stratosphere thanks to the US dollar's rise against the rupee and India's import tariffs, combined with Apple's lack of a significant ‘Make in India' story. Throw in Apple's apparent unwillingness to compromise on its margins even in markets like India, and we are now back to the “bad-old days” from a few years ago when Apple products were prohibitively expensive here and people relied on grey-market imports or friends making a trip to the US to buy Apple products. Amongst all of Apple's major product lines, the iPad probably has the “best” India pricing — and we use that term rather loosely — if you look purely at the USD to INR conversion. 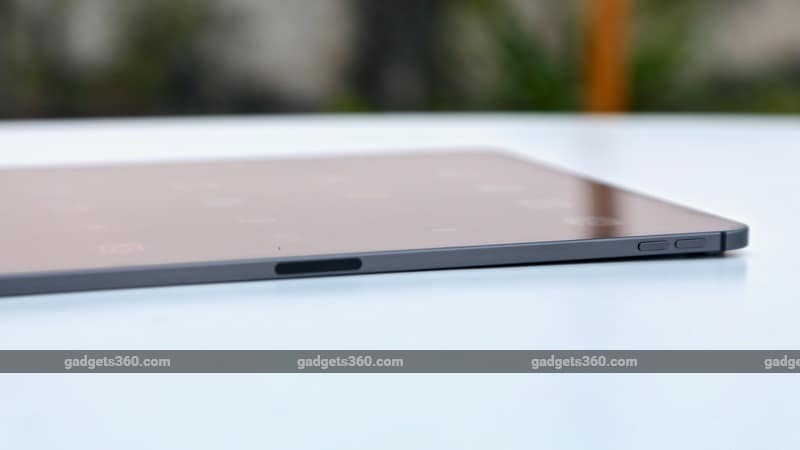 The iPad Pro comes to India at a starting price of Rs. 71,900 for the 64GB 11-inch Wi-Fi only model. Prices go all the way up to Rs. 1,71,900 for the 1TB 12.9-inch Wi-Fi + cellular variant we got for review. While that might seem like a crazy amount of money, we tried to find Windows laptops that have 1TB of solid state storage, and the least expensive one we could find is priced at Rs. 1,85,000, so that iPad price tag isn't as ridiculous as it may sound at first. In terms of raw performance, the entry-level iPad Pro will almost certainly outshine any equivalent laptop you can get at around the same price. If you can live with the limitations we've detailed here — and we believe the answer is ‘yes' for more people than not — what you'll get is a powerful, extremely portable machine with a display that's better than most laptops or 2-in-1s you'd get at the price. One look at India pricing of the Surface Book 2, for example, and the iPad Pro seems to look like a bargain, though Windows is probably a platform most legacy users would be more comfortable with. With iOS in general — and certainly on the iPad Pro — software progress seems to lag behind hardware, and we hope iOS 13 brings more productivity-focused features to the iPad. We would also like to see Apple force the hand of third-party developers to support iPad-specific features that the OS already supports. Of course, we would never recommend buying hardware on the promise — or in this case prospect — of future software upgrades, so any decision you make on the iPad Pro should be based on the experience we've described as of today. On the accessories front, if you are buying an iPad Pro, we would definitely recommend you get the Smart Keyboard Folio — or a third-party equivalent when they start to show up — as well. Be sure to factor in an additional Rs. 17,900 for the 12.9-inch model's Smart Keyboard Folio, which we agree is a ridiculous price. The Apple Pencil 2 is priced at a more “affordable” Rs. 10,900 but despite it's enhanced utility, we believe it's still an optional extra that only artists would really put to use, unless you are someone who prefers taking notes the old-fashioned way. The new design certainly means it's more likely to be used more often. Though one can easily hotspot from a phone, we would also recommend spending a little — okay, a lot — extra and treating yourself to a cellular variant of the iPad Pro if you are looking for a truly portable mobile warrior of a machine that'll let you work from anywhere. With the launch of the new MacBook Air, questions have been asked about the future of the 12-inch MacBook as well as the entry-level, non-Touch Bar 13-inch MacBook Pro. The duo wasn't updated when Apple refreshed its laptops earlier this year and given their overlaps with new MacBook Air, you can make a case for the newest Apple laptop to be a replacement for both of these computers. Indeed, with the T2 chip, Touch ID, faster SSDs, and more, the Air feels like an improvement over the basic MacBook Pro in at least some departments, and with all of that plus an extra port, it certainly has a leg-up on the MacBook. With that in mind, it can be argued that the iPad Pro is the new one-port MacBook — a general purpose computer with all-day battery life that'll do the job for most people — at least until those rumoured ARM-powered Macs show up and/ or that mythical iOS-laptop becomes a reality. product iPad Pro 2018 is faster than you can imagine but is it worth its price? Read our review to find out.